Yes, there are plugins that display the most popular posts on your blog, but they all tend to do a lot more than you need. Also I encourage you to read my previous post about unnecessarily adding plugins to your theme. Personally, I am not a fan of plugins, I prefer to use code snippets rather than using Plugins. Also, aren´t you eager to learn to code? The 2 images below show an example of the Most Commented Posts displayed at the top right sidebar of this blog, for 2 of the 4 themes I have available. The numbers between parenthesis represent how many times each post have been commented so far. Open the sidebar.php file located in your theme´s folder, and add (copy and paste) the following CODE-1 where you want your Most Commented Posts list to appear. Save the file and upload it to the server. * @Description: Displays the MOST COMMENTED POSTS in the sidebar of Your Blog. //If there are posts. checks to see if the current query has any results to loop over. //Iterate the post index in The Loop. //Destroy the previous query. This is a MUST. The most important part of the code are lines 13 to 28, these Lines should not be modified. The HTML tags can be changed or removed depending on your theme. Also CSS classes should be modified to fit your theme´s style. On line 14 of the code: I set the posts_per_page parameter to 5, meaning that the five Most Commented posts will be displayed. You can change this number to whatever you like. Also, if you totally removed posts_per_page parameter (if you removed &posts_per_page=5), then the Most Commented posts will default to whatever number you set it in your dashboard (Administration > Settings > Reading). Some themes have more variations of the sidebar.php file, so look at their documentation and see where best to add the code. For instance, for the “Clear Line” theme I added the code in “layouts/right-sidebar.php” file. The get_comments_number() template tag retrieves the value of the total number of comments, Trackbacks, and Pingbacks for a post. Even though I talk about placing the code in the sidebar. However; you can add the code anywhere you like on your WordPress Blog (left, right, header, footer). CODE-1 works on WordPress 2.3.0 and newer. But I hope that you will upgrade to the latest version. The Category/Tag IDs, specified above, are different in your case. If you don´t know how to find the category/Tag ID, read my previous tutorial on How To Find the Category and Tag IDs. Hopefully you got the idea how you can manipulate the query_posts() function for your specific needs. The query_posts() takes many more parameters than I discussed above. This is an example where I could add CODE-1 for the “Emplode Theme” of this Blog (in the sidebar.php file). Notice How I placed CODE-1 immediately before the start of the dynamic sidebar widgets. The Emplode theme sidebar´s CSS classes and HTML tags are being used to style and structure the Most Commented Posts list. As an example, CODE-1 is added to the sidebar.php file located in the theme folder. This is an example where I could add CODE-1 for the “Diary Theme” of this Blog (in the sidebar.php file). Notice How I placed CODE-1 immediately before the start of the sidebar widgets. The Diary theme sidebar´s CSS classes and HTML tags are being used to style and structure the Most Commented Posts list. As an example, CODE-1 is added to the sidebar.php file located in the theme directory. To style CODE-1 with CSS: Use the same styling as your sidebar´s Widgets (or your sidebar only in case your theme does not support widgets). You don´t have to do anything extra here unless you want to. Style it with what´s available for your theme. Same applies to the HTML tags, use the same layout available for your sidebar. For instance if you are using Google Chrome browser use the “Inspect element” feature to know which CSS classes you need to use or you could view the source code. For Mozilla Firefox browser, you could either check the source code or install the Firebug Add-on. Also be aware that HTML tags for CODE-1 can also be changed or removed depending on your theme. 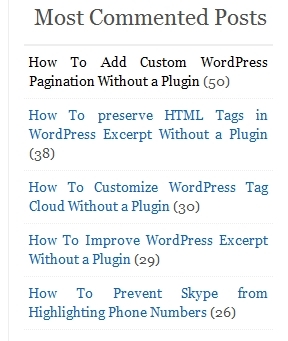 The code in this tutorial could be made as a customizable widget, so that non-technical users can easily integrate it into their blog from the WordPress dashboard (Appearance > Widgets panel). In this case you can place the Most Commented Posts list anywhere you like on the sidebar. Widgets require no code expertise. They can be added, removed, and rearranged from the WordPress dashboard. 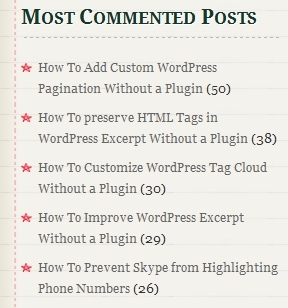 You now have the choice to Display the Most Popular Posts (Based on Comments) in your WordPress blog and without a plugin. This will hopefully entice your visitors to read more of your posts, thus reducing your blog´s bounce rate by going to other pages and keeping your visitors engaged longer on your Blog. This is incredible. I’m so excited to have found your site. I just used this to help me implement part of a new section at my futebolbrasileirao.com project.